The 24-7 Series 2-Ply Range Belt from Tru-Spec is designed for all-day wear--optimally suited for civilian or duty use. 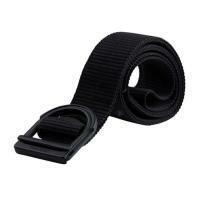 It is made from durable 2-ply nylon webbing for exceptional rip-resistance and high tensile strength. Heavy stitched reinforcements located strategically along areas of high wear make the Range Belt virtually indestructible. The friction buckle is constructed of anodized aluminum with a corrosion and scratch-resistant finish. Unlike traditional buckles, it can be set at any point along the belt, allowing for a custom fit and improved wearer comfort. The tip of the belt is tapered, ensuring smooth and effortless insertion through the buckle. With a width of 1.75 inches, Tru-Spec's belt will fit most pant loops.